A global mobile communications service provider wanted to understand customer location and travel patterns to support realtime promotions, advertising and up-sell of services. In addition, they desired additional, textured information to improve the quality of their network operations and provide enhanced customer service for their most important customers. We stored raw data as it was received for historical trends and analytics. 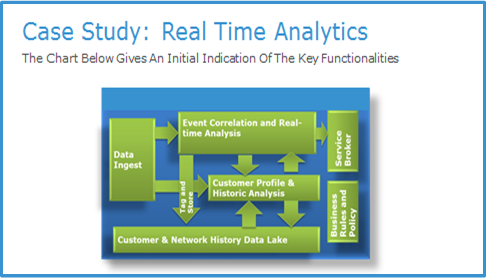 We ran realtime analytics models to identify patterns in the subscriber location data and to act upon the targeted behavior event. We loaded the network control data in a realtime streaming mode for more than 10 million subscribers. A single unit of our solution is capable of ingesting data up to 10TB/hr and it has linear scalability (i.e., 20TB/hr with two units). This client benefited by improved targeting of, and interaction with customers on multiple devices—not just smart phones. This resulted in wider coverage for targeted marketing messages. In addition, the client realized improved efficiency of marketing expenditures and was able to generate additional revenue from marketing agencies. 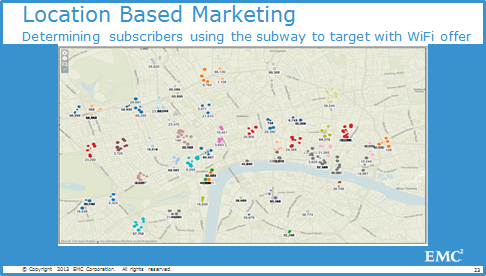 One example was specific location-based marketing: to identify subscribers that were approaching a subway entrance. The carrier’s normal coverage was not as effective underground, so they invested heavily in WiFi networks in the subway. Yet, their WiFi service was not getting expected “take” rates. This solution was used to send specific messages to subscribers about to enter the subway—to inform and provide an incentive to try the carrier’s WiFi. A second example was a campaign to communicate with subscribers within 30 seconds of experiencing a dropped call on the network. In this case, the action generated by our solution was to inform the users that the network operator was aware that the dropped call occurred and provide them a credit to their account. The examples cited above are two of many that are being implemented—by this mobile carrier and others. If you want more details that cannot be included here due to space constraints, please contact me at Laddie.Suk@emc.com. I welcome your request! This tip may seem pedestrian, but it absolutely helps bridge the miles/kilometers while you travel. Set up a routine time of day and day of week for the call. Send invites out with links to your web conferencing platform. While web conferencing has improved dramatically in recent years, I still find that a landline together with a separate audio conference bridge provides higher audio quality than using PC microphones/speakers in the Web conferencing platform. Staying in touch with home should be on everyone’s travel itinerary. Use your business technology tools to keep the work/life balance in harmony.